Nelson Appleton Miles (1839-1925) – Born near Westminster, Massachusetts on August 8, 1839, Miles was working in a crockery store when the Civil War broke out. Entering the Union Army in September, 1861 as a volunteer, he fought in a number of crucial battles and became a lieutenant colonel in May, 1862. 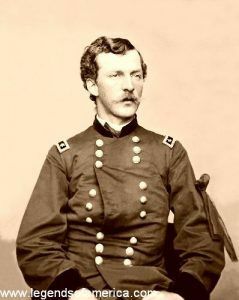 After the Battle of Antietam, he was promoted to Colonel and continued to advance during his military career. During the Civil War he was wounded four times in battle and fought in the Battle of Chancellorsville, Wilderness, Spotsylvania, and many more. After the Civil War, Miles played a leading role in nearly every phase of the army’s campaign against the tribes of the Great Plains. Then, in the winter of 1877, he drove his troops on a forced march across Montana to intercept the Nez Perce band led by Chief Joseph that had eluded or defeated every unit sent against it over the course of a 1,500 mile retreat from Oregon to the Canadian border. Miles earned the scorn of another fellow officer in 1886, when he replaced General George Crook as commander of the campaign against Geronimo in Arizona. Crook had relied heavily on Apache scouts in his efforts to capture the Chiricahua leader, but Miles replaced them with white troops who eventually traveled over three thousand miles trailing Geronimo and his band through the torturous Sierra Madre Mountains. Finally, Miles sent Apache scouts to help negotiate a surrender, under the terms of which Geronimo and his followers were exiled to confinement on a Florida reservation. Miles exiled his Apache scouts to Florida as well, although they were officially enlisted members of the army, and it was for this betrayal of troops who had served them both loyally that Crook never forgave him. The 1890 Ghost Dance “uprising” on the Lakota reservations brought Miles back into the field once again. In an effort to restore peace throughout the area, Miles directed troop movements that inadvertently panicked many Lakota bands into leaving their reservations and led both to Sitting Bull’s death and to the massacre of Big Foot’s band at Wounded Knee. Miles reacted to these developments by working aggressively to implement his longstanding belief that the Lakota should be forcibly disarmed and placed under military control. In 1895, he was named Commanding General of the U.S. Army, a post he would retain though the Spanish-American War. He achieved the rank of Lieutenant General in 1900 based on his performance in the war. Afterwards, he wrote several books and served on various commissions. Miles was the only man to have served as a commander in the Civil War, the Indian Wars, and the Spanish-American War. In his late 70s, he volunteered to serve in the army during World War I as well, but was turned down by President Woodrow Wilson. Miles died on May 15, 1925 at the age of 85. He was the last full-rank major general of the Civil War.